Acute inflammatory response and its ideal outcome: complete resolution. (A) Temporal lipid mediator class-switching initiates active resolution and SPM biosynthesis. Defined steps in the acute inflammation time course: edema, PMN infiltration, and then non-phlogistic monocyte-macrophage recruitment to inflammatory exudates. 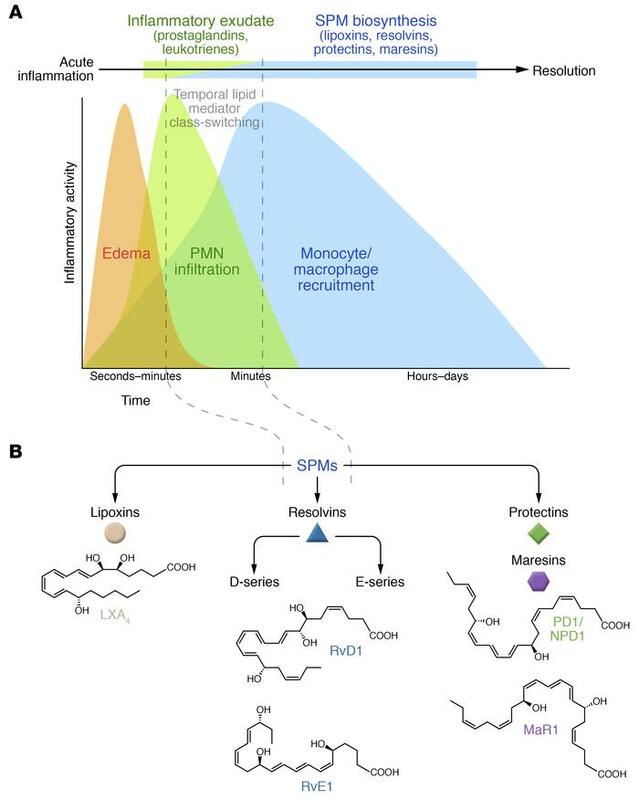 The reduction in PMN number coincides with the exudate appearance of SPMs and with the biosynthesis of lipoxins, resolvins (E- and D-series), protectins, and maresins in resolving exudates. (B) Each family of SPMs is structurally distinct and possesses potent pro-resolving actions.